They've spent months directing their investigative firepower at the Justice Department, sparring with senior law enforcement officials over documents and raising questions about the Hillary Clinton email and Trump-Russia probes in what Democrats have decried as an effort to undermine special counsel Robert Mueller. 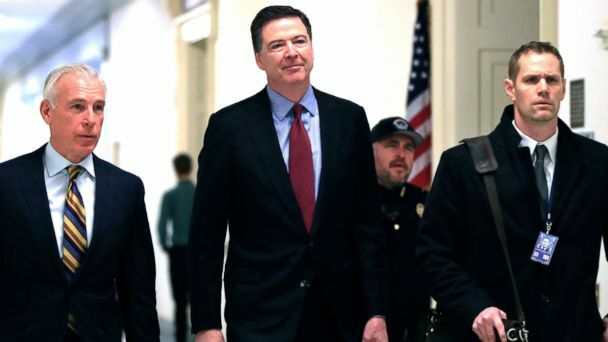 Now, as they prepare to turn control of the House over to Democrats, Republicans on the House Oversight and Judiciary Committees questioned former FBI director James Comey Friday after subpoenaing him and they want to question former Attorney General Loretta Lynch as well. After a full day behind closed doors on Capitol Hill, Comey emerged exasperated but committed to returning for yet another round. "When you read the transcript, you will see that we are talking again about Hillary Clinton's e-mails, for heaven's sake, so I'm not sure we need to do this at all," Comey told reporters, adding "a whole lot of Hillary Clinton's emails, which will bore you." Comey is set to return for even more questioning the week after next. A transcript is supposed to be released over the weekend. While several Republican committee members were frustrated that Comey declined to comment on certain lines of questioning because of special counsel Robert Mueller's ongoing investigation, Comey said those areas were "a very teeny part of what we talked about today." Earlier, Comey, who has been highly critical of President Donald Trump since his firing last year and spoken repeatedly to other congressional committees and news outlets about his experience, scrapped a legal challenge to the GOP subpoena. He reached an agreement with Republicans to appear provided they release a transcript of the interview within 24 hours and allow him to speak publicly about the session after meeting with lawmakers. The GOP-led Oversight and Judiciary investigation has culminated in a series of high-profile and contentious public hearings on the Hill: one featuring Peter Strzok, the FBI agent who helped lead both inquiries and sent provocative political text messages to a colleague with whom he was having an extramarital affair, and another with Deputy Attorney General Rod Rosenstein, a frequent target of Trump allies for his supervision of Mueller's investigation. House Republicans have also raised questions about the government's use of confidential sources and the surveillance of former Trump campaign aide Carter Page, including the materials used in the Foreign Intelligence Surveillance Act warrant applications approved by judges under the law. In July, the Justice Department released hundreds of pages of wiretap warrants for surveillance of Page, in response to Freedom of Information Act lawsuits from news organizations, after Republicans and Democrats on the House Intelligence Committee released dueling memos about their importance. The House Republican investigation has continued despite the findings of the Justice Department inspector general, who concluded in a report last summer that the FBI's controversial investigative decisions during the 2016 presidential election were not politically motivated, but did damage to the bureau's reputation. After the interviews with Comey and Lynch, who have both appeared before other congressional committees, Rep. Mark Meadows, R-North Carolina, said Republicans would next turn to summarizing their findings. "It would be prudent to get a report out before the end of the year but if we don't we can always issue it as a minority report that comes out unattached to a task force that will surely be dissolved," he said. Lynch is expected to appear later this month, according to congressional aides. A representative for Lynch did not respond to a request for comment. Democrats say Republicans have been working to undermine the Mueller investigation and defend Trump. Rep. Jerry Nadler, D-New York, who is set to become chairman of the Judiciary Committee next Congress, told reporters he would end the probe. "These are the last gasps of the GOP fishing expedition into Hillary Clinton," Rep. Raja Krishnamoorthi, D-Ill., a member of the House Oversight Committee, told ABC News. But Krishnamoorthi said Democrats could invite Comey to testify in 2019, calling him the "right witness being called for the wrong reasons." "There's more news coming out every single day about the Russia investigation," he said, referencing new reports. Comey said he would be willing to appear for Democrat-led hearings. "I would love it if they didn't want me to testify. If they want me to testify, and we can do it in a responsible way, I will abide it," he said. Republicans expect the GOP-led Senate could continue pursuing related inquiries, something Sen. Lindsey Graham, R-S. C., the incoming chairman of the Senate Judiciary Committee, appeared to confirm on Thursday. "I'm going to start with the FISA warrant process and see where that takes us," he told reporters. ABC's Trish Turner and Sarah Kolinovsky contributed to this report.